of the first Mediation Council. 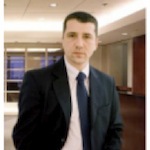 Adi Gavrila is an engineer, a jurist and a mediator, dedicating a great part of his professional activity to mediation, ADR management, dispute resolution system design and mediation training since 2002. He has been responsible since 2003, for the management of the Mediation Pilot Centre in Craiova and co-ordinated extended programs in mediation: the Centre’s mediation activities (over 1000), training of mediators (500 per year), systems development, and information dissemination. He has a co-ordinated the national training program of mediators during 2004 and 2006, in which 10 lawyers from every county of Romania were trained, and thus formed mediation centers in each county. In 2005, these centres formed the Romanian Mediation Centres Union Federation. Adi Gavrila has taken part, along with other experienced mediators from Romania in over 100 conferences and seminars both all over the country and abroad. He also published articles in Romania and abroad (e.g. ACR-International Spring 2004 – „Mediation – Romanian style” together with Kathleen Patterson).